After reviewing a number of laser training systems, I now have the pleasure of testing Next Level Training's SIRT Pro Training Pistol. I got a few minutes with this tool at SHOTShow 2014, and was very impressed with the realism of the product. 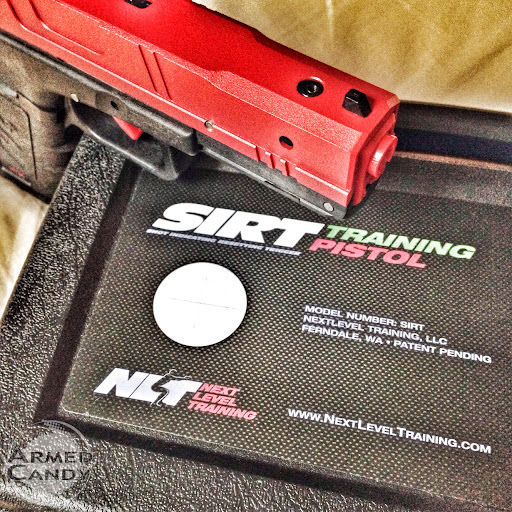 The SIRT Pro is shaped just like a Glock 17. The slide is metal and the frame plastic, just like the real thing. Even the weight is similar and it has a detachable weighted magazine. The SIRT has two built-in lasers. The laser that comes from within the muzzle is green and appears when the trigger is fully depressed. A red laser appears from just below the muzzel and is activated anytime the trigger is touched. It is called the "trigger prep laser". A small switch on the top of the slide allows the user to turn the trigger prep laser on or off. These are the only function options the SIRT offers. Why would you want the trigger prep laser on or off? Well, if you want to see the difference in the movement of the gun from the beginning to end of your trigger press, the first light can be helpful. It can also be useful to an instructor who is watching over your shoulder.